One word or one thought can make all the difference. Let’s take two scenarios where one word or one thought can make all the difference. Imagine you are in the library where you find yourself in the self-help section and you decide to have a little look at the books. You come across two books that are very similar in size and their front covers look identical. The only real difference is the title. Which of the following two titles would you choose to get answers for? How to cope with life’s ups and downs. How to enjoy life’s ups and downs. Both titles are very similar except for one word. It’s funny how one word can play a deciding factor in what we do. Did you choose the word COPE or ENJOY? If you chose number one, it’s likely that you like to look for solutions and strategies to help you cope with life. If you chose number two, it’s more probable that you’re looking for fun and excitement to help you enjoy life. Depending on which book title you chose will depend on your mindset and how positive you are feeling at that particular moment. Both titles acknowledge that life has ups and downs; good days and bad days; positives and negatives. What do you think when you see a rainbow? Is it a moment to “ooh & ahh” while looking around for a smile to share the rainbow with? Or do you look for the end of the rainbow to find the pot of gold followed by a sigh that you’ve forgotten your umbrella? In same way as one word influences us so too does one single thought. Next time you find yourself looking at a rainbow consciously think about how you view life. Consciously change your mindset. 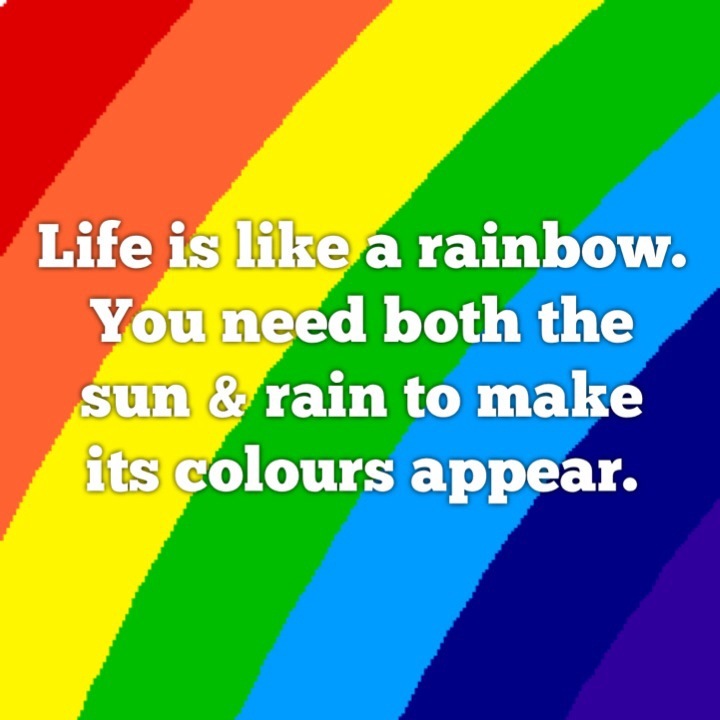 There’s always a positive thought in a rainbow. Sometimes you just have to look a bit harder! But is there, if you want to find it. Appreciate the rainbow. At the same time, appreciate your family and friends that are always there for you. Visualise your friends and family at the end of the rainbow instead of the little man in green! Smile at the rainbow – enjoy the colours and think about how lucky you are if you see a double rainbow. Rainbows only happen when there is both sun and rain. View the bad times as raindrops, that are there to help us learn more or to see that something else is going on that we need to take on and react to more positively. The sun is always there, just like the good times are always there. How we view things can be changed simply by changing one word or one thought. Choosing that word or thought can have such a massive influence over how we feel on a certain day or about a particular situation. It’s not to say that we have to think positively all of the time but many of us end up worrying too much over a small situation that leads to us being stressed and not feeling in control which then leads to a dip in our confidence levels. Changing our mindset to develop a more positive outlook certainly helps. One word or one thought can make all the difference; choose them wisely.